I absolutely LOVE finding silly ways to incorporate my booze geekery into my everyday life. You know, aside from drinking ALL OF THE BOOZE. 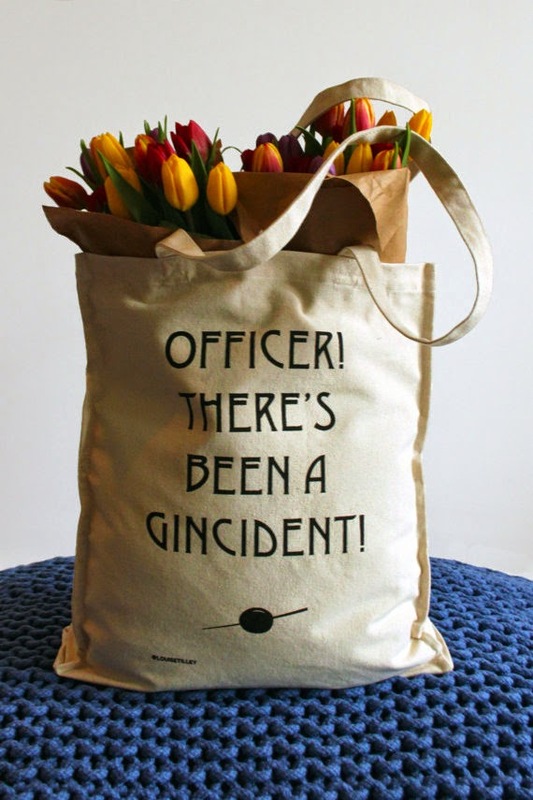 So I was pretty chuffed to find London-based designer Louie Tilley on Etsy, who has designed the perfect shopping bag for gin lovers. The 'Officer! There's Been a Gincident!' tote bag is not just funny, but deliciously vintage-looking, so it wins extra points in my book. And it's deceptively big, so you can fit LOTS of nice things in it. I could easily think of a dozen friends that would shriek with delight if I gave them one of these for their birthday - and then immediately make me a gin and tonic as a thank you. So, even more of an incentive to buy one, then. I'm pretty impressed because - despite the fact Louie is a lovely and talented designer, with very good taste in alcoholic beverages - the shopper is only £20 from her Etsy shop! AND there's even a slightly smaller (but by the looks of it, wider) one for just £12! That's less than half a bottle of decent gin! I hope Louie releases some other boozy designs soon - I'll be sure to let you know if I spot any. In the mean time, please feel free to tell me in the comments section below about any other brilliant gin gifts you've found - or take a look at our Gifts for Gin Geeks post for more inspiration.